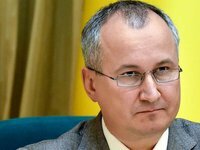 On board Ukrian Navy ships attacked and captured by Russia in the Kerch Strait on November 25 there were counterintelligence agents from Ukraine's SBU State Security Service, SBU chief Vasyl Hrytsak has said. According to the press service of the Security Service of Ukraine, officers of the Ukrainian special services performed official tasks for counterintelligence support of the Ukrainian Navy unit, as provided for in Article 12 of the Law "On the Security Service of Ukraine." “For more than four years of Russian aggression, Ukrainian military counterintelligence has been on the front lines, fighting side by side with the Armed Forces of Ukraine, the National Guard and the State Border Service. And this will always be so," Hrytsak said. Russia used six vessels under the command of Russia's Federal Security Service (FSB) and four navy vessels, as well as military aircraft, including helicopters. “According to the confirmed operational SBU information, one of the Russian attack aircraft fired two unguided rockets at the Ukrainian boats, as a result of which one of the SBU officers was seriously wounded,” the SBU said, adding that it is doing everything it can to secure the release of the detained seamen and return them to their families. "At the same time, the SBU demands Russian special services stop exerting psychological and physical pressure on those detained," the SBU said.